Chicken and Sausage Cajun Jambalaya is a smoky and flavorful one pot meal. 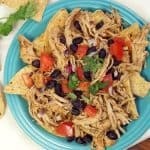 Whether you like it spicy or mild, this recipe is sure to be a favorite for family dinners and parties. 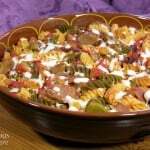 Jambalaya is a Louisiana dish with heavy Spanish, French, and Caribbean influence. The dish is thought to have been originally developed by the Spanish settlers to the New World who attempted to make paella. Saffron, paella’s key ingredient, was incredibly expensive to import to the New World, so they had to find other ways to flavor their rice dish. They decided that tomatoes were the perfect way to give the dish the extra color and flavor that it was missing from the lack of saffron. Red Jambalaya or Brown Jambalaya? You will find two major categories of jambalaya: red and brown. 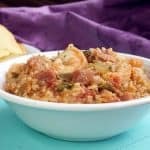 Cajun jambalaya does not have tomatoes, giving it the nickname “brown jambalaya.” But, it’s not just the lack of tomatoes that contributes to the brown color. 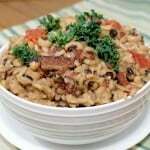 After all, without tomatoes, the jambalaya would be closer to white rather than brown. Why is brown jambalaya brown? 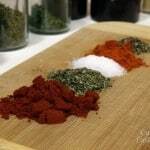 The brown color in Cajun jambalaya comes mostly from the cooking method. The meat and veggies are cooked first over a high heat. While typically you would want to add lots of oil when high heat cooking to prevent bits of meat and vegetables from getting stuck to the bottom of the pan, in this case, only minimal fat is used to grease the pan because we actually WANT those stuck bits. The Cajuns even have a name for them: graton. Once the pan is de-glazed by the addition of chicken stock, these deeply caramelized bits get scraped up and mixed in with the other ingredients, giving the jambalaya a smoky flavor and brown color. What is the Holy Trinity in Cooking? 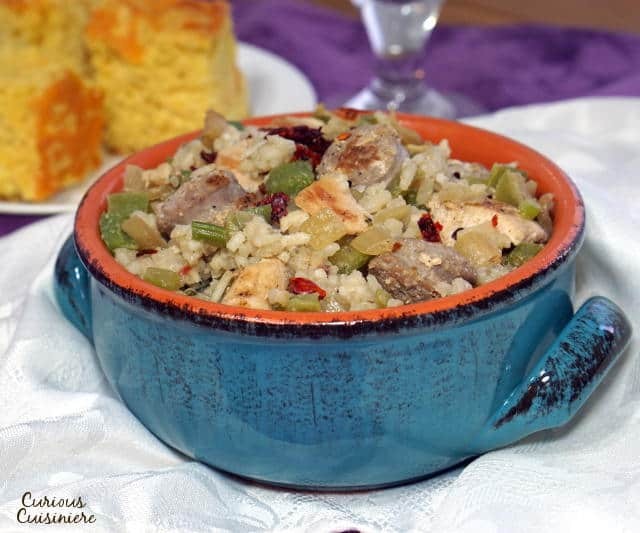 The base of either jambalaya version is a combination of vegetables that is known as the “holy trinity” of Cajun and Creole cooking. This mixture of onions, celery, and green peppers creates a fragrant base of flavors that has become characteristic of the region’s cuisine. If you think it sounds familiar, you’re right. This veggie combo is a spin off of a trinity that is often used in French cooking, called mirepoix. The French mirepoix consists of onions, celery, and carrots. 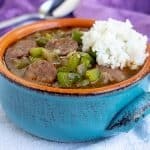 The substitution of green peppers for carrots gives Cajun and Creole food a tendency toward that savory pepper flavor, rather than the sweet, caramelized notes of the carrot. A final note about sausage. 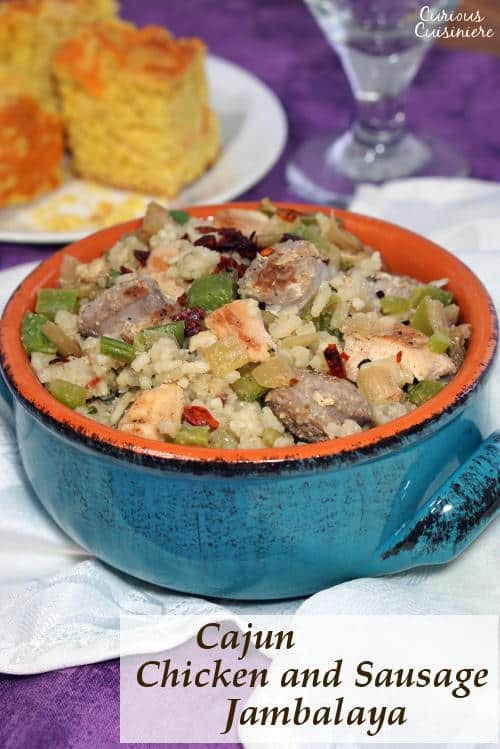 For this Chicken and Sausage Jambalaya, a smoked pork sausage, like the Louisiana classic Andouille sausage, will give you the most authentic flavor in your jambalaya. But, if you can’t find Andouille, feel free to use your favorite smoked sausage. 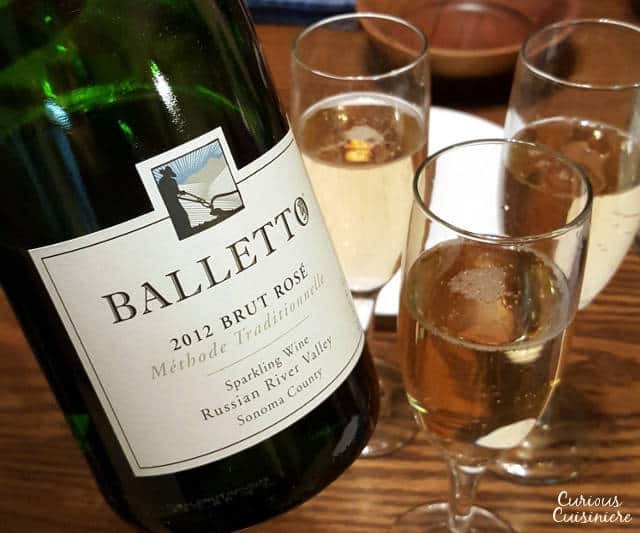 We paired our Cajun Chicken and Sausage Jambalaya with Balletto Vineyard’s Brut Rose. We loved the luscious, full flavors of this Rose and the red fruit notes that came from the 70% Pinot Noir grapes that make up the blend. It is a perfect sparkling wine for drinking alone, but it offered a wonderful complement to the slightly spicy jambalaya. If you’re looking for a non-sparkling wine, we’d suggest a Pinot Grigio, whose light flavors would complement the light spice of the dish. If beer’s more your thing, we’d go with a light Marzen style (like an Oktoberfest). A smoky and flavorful one pot meal. Heat a Dutch oven over high heat. Add cubed chicken and sliced sausage. Sauté until the meat is deeply golden on all sides, 7-10 min. 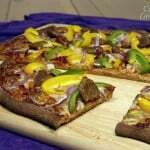 Reduce the heat to medium-high and add the diced onions, green pepper and celery. Sauté until the vegetables are golden brown, 10 min. When the rice is done and the liquid has been absorbed, remove the Jambalaya from the heat and let it finish steaming for 5 minutes. Give the Jambalaya one good stir. Taste it and adjust the salt and heat to your preference. Serve immediately with a big slice of cornbread and some steamed greens. 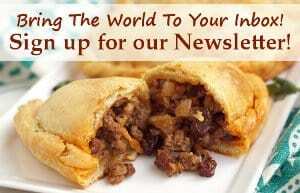 Disclosure: We received samples of the wine mentioned in this article free of charge. As always, we only feature what we think you, or readers, will love, and all opinions are our own. Love the explanations of the two types. I also enjoy the ‘history’ of each. As a fan of history, it’s always fun to read and understand how a thing came to be. On our site my wife allowed me to make some seed cakes which were mentioned in “The Hobbit”. With some reading up and understanding where Tolkien grew up and at what time I found a recipe that pretty much matched what he ate as a child which he brought to life in his classic. It literally is like taking a bite of history. How fun! The research behind the recipes really makes them come to life! 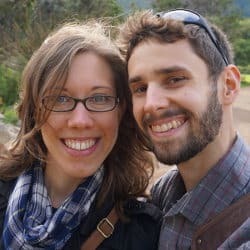 Thank you for the brown jambalaya recipe, I’ve been looking for a good one that I could modify to meet the dietary restrictions of kidney disease and diabetes (low sodium, low carb). Most low-carb jambalayas online are Creole and to me, tomatoes in jambalaya are as sacrilegious as sugar in cornbread. I replaced the salt & pepper with Frere Jean’s salt-free Cajun seasoning, used 1 1/2 cups of salt-free stock I make myself and replaced the white rice with riced cauliflower. I scoured the store until I found a low-sodium sausage, used about 1/4 lb. and cubed it like the chicken. After deglazing, I just added the cauliflower, stirred well, then simmered for about 10 minutes or so, as there is always the danger of overcooking the cauliflower and it being soggy. It actually came out pretty good, and totally satisfies my jambalaya cravings, which are fairly strong as I grew up in Louisiana and ate jambalaya at least once a week growing up. Thanks! Wonderful! So glad it satisfied your cravings! Made my Creole-style jambalaya yesterday. Sendik’s carries Usinger Andouille near the meat case – it’s pretty good. Cooking the sausage and trinity in a minimum of fat (1 tablespoon butter) still develops a nice fond. Aside from the addition of tomatoes (and a bit of sauce), I’ve a lot more spices in mine – three kinds of pepper (though only 1/3 tsp of cayenne for generous servings), rubbed sage, basil…the ending feel is definite heat, but no actual flame, so to speak. Mine is also baked to finish, once everything is in the pot. This is one of my favorite winter one-pot meals. 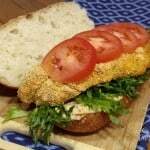 Easy to make, lots of leftovers for lunches, complete meal on its own. Yours sounds like a wonderful Jambalaya. It definitely is a nice, warming meal for the winter!